Everything is the fault of our past, nothing is our own fault and we look the other way when friends, comrades and colleagues are caught in the web of corruption, says Mathews Phosa. Allow me a few remarks about our current political environment. Kindly see my remarks against the background of my view that we all hope and pray for a happy, economically flourishing South Africa where black and white live together in harmony. Let us, for the sake of today's proceedings agree that apartheid's shadow will forever hang over us. Let us also agree that when South Africa at last tasted democracy and liberation in 1994 wealth distribution was dramatically skewed and that we had to take substantial steps to rectify that. Having said that, however, I do not understand that, 25 years and five elections later, we cannot admit that we have made grievous mistakes in terms of creating a better life for all. The truth is that we have simply not been successful in changing the social and economic landscape of our country. We have struggled to make the transition from a majority in the struggle to being a majority in government. We have all the levers and resources of government in our hands, yet we we are struggling to effectively utilise them. The various commissions of inquiry into our ability to govern without capture or corruption have cast a shadow over our national pride and shocked even the most loyal of supporters. The extent of inexcusable theft and corruption, which tainted high level leaders of our government, is inexcusable. No amount of spin will change that. In a stable democracy we need to respect the fact that Parliament, the judiciary, civil society and the media should shine their respective lights on our actions. We should, in fact, welcome it. Evil thrives in darkness and in places where scrutiny is avoided. Criticising the institutions that bring wrongdoing to light is not in our interest, let alone that of a young democracy. Our inability to deliver on the promise of a better life for all has deepened the divide between the rich, the middle class and the poor. Instead of our government creating a channel for the poor to migrate to the middle class we have the shocking situation that the number of those at the bottom of the economic ladder have, in fact, increased. Therein lies our biggest challenge and also, perversely, manna from heaven for the opposition parties. In the fierce election debates between the governing party and the opposition parties I see very little of the kind of leadership that I expected democratically elected leaders to give. We are catching flies off one another, we are criticising each other's policies and we engage in horizontal, divisive debates instead of lifting up our eyes to the plight of those who we were elected to serve. The masses are forgotten in our election fever. In short, we have a crisis of morality. Everything is the fault of our past, nothing is our own fault and we look the other way when friends, comrades and colleagues are caught in the web of corruption. Instead of catching those who have committed criminal acts we criminalise those who have the courage to speak up against it. The number of people who are hungry, ill, uneducated, homeless and without jobs are growing. No amount of glossing over figures can change that hurtful fact. A very good start would be to own up to our collective mistakes and build a clean platform to a prosperous future. In election time, however, this might be fanciful thinking on my part. Whatever the outcome of the election, it is time that we look further than our own interests and develop multi party solutions to the plight of the most vulnerable in our society. We are sitting on an explosive mix of poverty, unemployment, energy shortages, sickening levels of corruption and the "blame it on anyone but us" phenomenon. The truth is that we, as a collective, have stolen millions that should have been spent on creating food security, housing, education and health security nets for the poor. 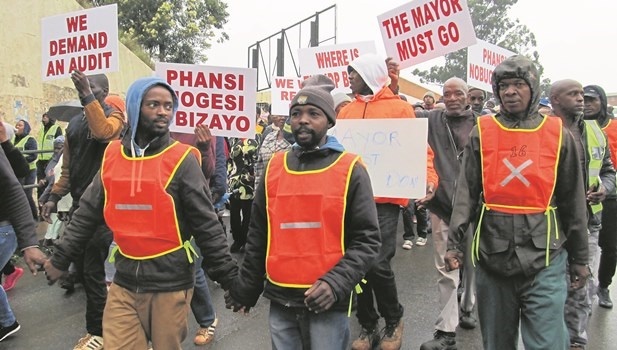 The Zondo and other commissions of inquiry have confirmed what we have always feared, namely that families such as the Guptas and companies such as Bosasa came perilously close to capturing the state. In the process many billions of rands of taxpayers' money found its way into the pockets of devious criminals, here and abroad. Due to a politicised NPA, we have very little to show in the area of prosecuting those at the highest levels of wrongdoing. Not only did we lose billions of rands but key state institutions such as Eskom, SAA, Denel, SARS, the PIC, the National Prosecuting Authority and various others were infiltrated, captured and weakened. We can never, never again revert to a state where a particular political agenda, whether that of a collective or individual, slows down and almost kills service delivery as well as the administration of justice. My hope and prayer is that the post election government, or governments, will remember what they were elected for, namely to improve the lives of those they serve, to create prosperity, to foster reconciliation and to substantially broaden the economic middle class of our country. In broadening our middle class we cannot continue with the outdated operational model that the state itself should create jobs through bloated institutions that have failed repeatedly. A smaller, delivery friendly state will be an excellent start to renewing our pact between those who were elected to govern and the frustrated electorate. Our record in creating successful state owned enterprises have been less than encouraging as, for instance, Eskom illustrates. In my modest view our focus is wrong. We are watching each other's political moves, we are discrediting each other, and, in the process, again, forgetting what it means to serve, to protect, to be fair and to be honest. We are functioning in our own, closed bubble, forgetting our role as servants and leaders. The time will come when the electorate will punish us, either through the ballot box or through social and civil disobedience. We should, at speed, re-connect with those who feel that we have abandoned them in the process of filling our own, and that of our families' pockets. We should all reshape our goals and objectives and find that something that is bigger than our own interests. If we don't, our legacy will be forever be tainted by the memory of what the Guptas, Bosasas and our own role in the misdirected capture of state institutions did to our country's fortunes. I hope and pray that we can find it in ourselves to speedily correct the course we have chosen and govern without fear, favour, prejudice or capture. * This is an extract from a speech Dr Mathews Phosa gave at the WRSA 2019 "Up-your-game" Annual Conference held in Pretoria on Saturday, 6 April.